With a combined 50 years on stage, George and Tracey joined forced to teach “Messenger training from the inside out.” Together, they help women in business, speakers, authors, coaches and entrepreneurs to step into their authentic voice and own any stage. Through live events and unique coaching programs, Tracey and George gently guide woment through a deep dismantling of egoic attachments, replacing them with empowering truths, turning Spiritual Practice into Practical Business Strategy. 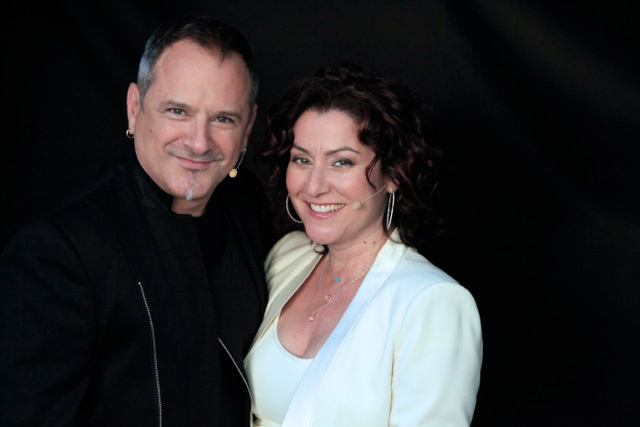 With years of experience in corporate and corporate training, and as an entrepreneurs, keynote speakers, master trainer, Conscious Communication experts, George and Tracey have spoken to, trained and coached tens of thousands of people internationally. Tracey has shared the stage with luminaries such as Les Brown, Lisa Nichols, Marianne Williamson and more. George is a recognized coach to performers, athletes, C-suite executives and entrepreneurs for nearly three decades, having shared the marquis with inspirational greats Zig Ziglar, Denis Waitley and Brian Tracy. As an expert in Feminine Leadership, Tracey co-authored the 3-category Amazon Bestseller “Faces of the New Feminine Leadership” and was a top ten finalist in “North America’s Next Greatest Speaker” competition. George has written 8 books, is a former lawyer, single dad, two time cancer survivor and now “presence advisor” to some of America’s most noted rock musicians. Together, what sets George and Tracey apart is the love that is infused in everything they do, speak, teach and create. Together, this due Co-hosts the popular women’s empowerment event, “Own, Honor and UnleashTM” and the unique messenger training program “Speak with SoulTM” as well as the podcasts “The Deeper Conversation” and “Prosperity Playground”. George and Tracey have invested their lives in the intellectual and spiritual understanding of conscious communication. They’ve seen first hand the power words can have. They’ve invested their lives in understanding how. Whether exploring the depths of spirituality or discussing leadership strategies for the 21st century – or both – George and Tracey provide valuable insperational insight because over their lives, they’ve done it. The programs offered by Amazing Women International, Inc. have been called the Harvard MBA of Conscious Communications. Together, this dynamic duo guide Messengers ready to create, embody and lead transformational conversations in our world. Tracey and George founded “Voices for the Voiceless;” a not-for-profit fund to support women, children, animals, cancer survivors and mother Earth.